"Today's decision is a victory for consumers," Paul Clement, the attorney representing the broadcasters, said in a statement. "The Court has sent a clear message that it will uphold the letter and spirit of the law just as Congress intended." The ruling essentially protects billions of dollars in retransmission fees that broadcasters collect for their signals. Media stocks rallied after the news was announced. Ever since Aereo was introduced in early 2012, its biggest financial backer, Barry Diller, has said that there is "no plan B" if the courts concluded that it was operating illegally. Diller said in a statement Wednesday that the court ruling was a "big loss" for consumers who seek alternatives to the cable bundle. Aereo Chief Executive Chet Kanojia similarly called it a "massive setback for the American consumer," but indicated that Aereo would try to stay alive. "We are disappointed in the outcome, but our work is not done," he said. "We will continue to fight for our consumers and fight to create innovative technologies that have a meaningful and positive impact on our world." He did not elaborate about next steps for the company, and an Aereo spokeswoman did not respond to a request for comment about whether its TV streams would or could stay online. Related: What the heck is Aereo anyway? 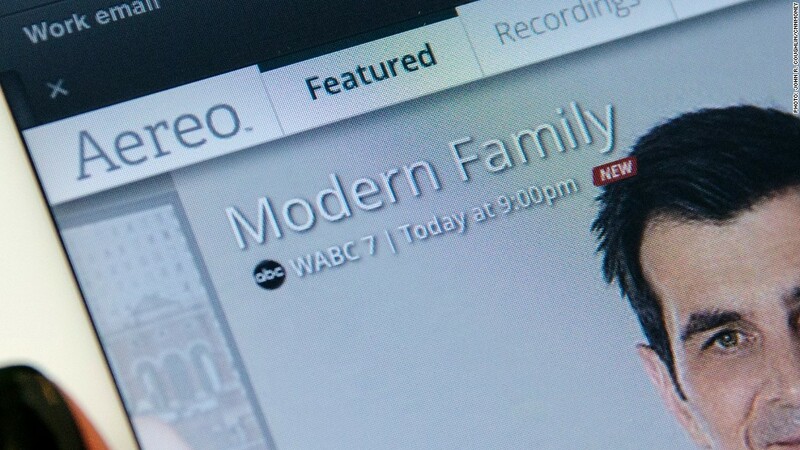 A group of broadcasters sued Aereo in early 2012, before it had even launched in its first market, New York City. The broadcasters asserted that Aereo violated copyright laws by allowing "public performances" of their TV shows. Aereo said it was only enabling private screenings, just like off-the-shelf TV antennas do. The issue reached the Supreme Court last fall and the case was heard in April. Wednesday's ruling sends it back to the Second Circuit court, where the case began. "Aereo is, essentially, simply an antenna device that replaces technologically what you used to have to do — to go up to your rooftop and erect an antenna," Diller said in a CNN interview after the hearing. But on Wednesday the Supreme Court agreed with the broadcasters that Aereo qualifies as a "public performance." The formal issue before the court was "whether a company 'publicly performs' a copyrighted television program when it retransmits a broadcast of that program to thousands of paid subscribers over the Internet." The justices issued a relatively narrow ruling, written in such a way that other companies that provide media storage on the Internet would not be harmed. "We believe that resolution of questions about cloud computing, remote storage DVRs and other novel matters not now before us should await a case in which they are clearly presented," Justice Stephen Breyer wrote. So while this ruling on copyrights could make it harder for other companies relying on the growing cloud computing technology to promote their entertainment and information options, it doesn't prevent new technological and financial avenues from being explored. "We are pleased with today's decision, which is great news for content creators and their audiences," CBS Corp. said in a statement. "We're gratified the Court upheld important Copyright principles that help ensure that the high-quality creative content consumers expect and demand is protected and incentivized," said ABC's parent, The Walt Disney Co (DIS). --CNN's Bill Mears contributed reporting from Washington, D.C.